"...Varner has recruited an impressive group who are among the hottest if not finest modern jazz musicians on the scene today.... There's a lot to get excited about on Swimming as Varner excels as a multifaceted composer who injects a good deal of emotion and color into his work which is enhanced by a supremely motivated ensemble who share Varner's plight and compelling vision. After listening to this recording several times, it became apparent, that Varner has established a unique jazz vocabulary. Swimming should not go unnoticed! Highly recommended." "[Varner] has patiently opened the doors to a very personal American music, drawing on jazz and other traditions and turning out some of the best New York records of the 90's." "...Varner has a Mingus-like gift for intertwining complex counter-melodies in a manner that's more soulful than acrobatic. This approach creates countless opportunities for inspired improvisation ... Swimming is a marvel of cohesive ensemble writing and playing..."
"The music [is] swinging, intense, uncommon and wholly mesmerizing." "This intriguing disc floats on beautifully structured solo and ensemble sections filled with the rich, resonant sound of Varner's facile French horn playing.... The French horn is one of the most beautiful and engaging of all brass instruments, and Varner's one of the few who play it so well in such a fine jazz context. Recommended. "...more traditional strains are also informed by the contemporaneous sensibilities of Charles Ives, as well as the later ones of Henry Threadgill and Charles Mingus. And, like [William] Faulkner, Varner plays with time and narrative structure in fascinating ways." "Tom Varner is that special kind of new jazz master who is pushing the music in new directions... an intense, profound and stunning hybrid of dazzling improvisations and cleverly abstract musical forms and melodies.... It is Varner's writing where the mastery starts and his use of space, interplay, movement and time signatures keep the listener on the edge of their seat. Nothing is predictable here. Swimming is more than a splash!" "What keeps both the players and listeners on their toes is the eclectic world of inspiration that Tom draws from —biblical themes, science fiction, folklore, kitsch, funk and modern classical music.... One of the highlights of this great CD is the 'Seven Miniatures for Mark Feldman', which pushes Mark's wondrous violin through a diverse array of styles/genres - inside & outside, modern jazz & classical, somber & explosive, Mark is magnificent when given the chance to push the limits.... Another excellent offering from Tom Varner and company." "...a welcome burst of quality, a gold nugget after a hard day of coming up from the mine empty handed." got an impeccable melodic sense, making songs that ring memorably long after they've departed." "...Varner's playing is articulate and dazzling throughout. His lower-register work on the usually unruly French horn is, in fact, quite stunning. 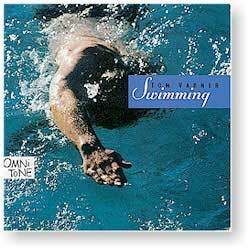 If you are unacquainted with Tom Varner, Swimming is as good a place as any to begin. And those who already know his music will not be disappointed."